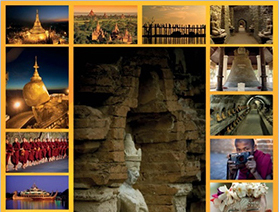 Bagan Thiripyitsaya Sanctuary Resort is considered to be Bagan’s premier hotel. Aside from attractively appointed bedrooms and suites, it offers world-class cuisine and other amenities such as a Spa and the biggest outdoor pool and sundeck in the area. The Hotel @ Tharabar Gate is ideally located right in front of the legendary gate of this 10th century city, Bagan. Each of the colonial-style guestrooms is tastefully decorated with teak wood fittings and traditional Burmese antiques. This resort is one of the two tallest buildings in Bagan built in the traditional styles of ancient Burmese architecture. The Hotel welcomes you to enjoy ancient capital and explore archaeological zones in modern day comfort. Myanmar Treasure Resort (Bagan) is situated inside the Bagan Archaeological Preservation Zone, within easy reach of all tourist sites in the locality. Featuring an outdoor swimming pool and garden, Raza Gyo Hotel offers rooms in Bagan, 2 km from the Ayeyarwady River riverfront. The property has free Wi-Fi access throughout. Boasting an outdoor pool, Bagan Umbra Hotel is located within 2 kilometres from the ancient capital of Myanamar: Old Bagan, one of the richest archeological sites in Asia from 10th to 13th century and Nyaung U Airport. It offers free WiFi in all areas. On-site parking is available for drivers. The beautiful resort property is located in Old Bagan, which houses one of the most interesting cultural heritages of Myanmar-thousands of pagodas spread across rust coloured plains flanked by the meandering Ayerwaddy river. This incomparable Resort and Spa set amid 27 acres of Tropical landscaped gardens offers the ultimate in luxury for guests seeking a superlative vacation experience. Museum quality antiques and artifacts adorn each villa, complementing the majestic ambiance of the resort.